As their name implies, Nightsnakes mostly come out at night (although I found one in southern Utah at about 9:30 in the morning a few weeks ago), and even then they are normally only active under certain conditions - in particular, they prefer to be active when there is not much moonlight, such as on cloudy nights or when the moon is new. Even if one is specifically searching for Nightsnakes, they can be difficult to find. Combined with their generally secretive nature, this could explain the failure of several Clarión Island expeditions to find the Clarión Nightsnake - until Mulcahy's expedition in May of 2013, which found 11 individuals in 15 days. 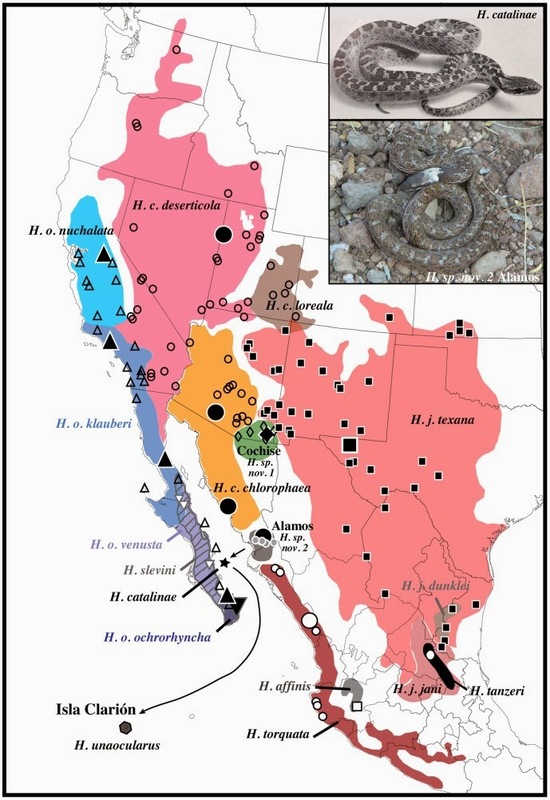 Using phylogenetics, they determined that the Clarión Nightsnake is most closely related to the Santa Catalina Nightsnake (H. catalinae), which is found on Santa Catalina Island in the Gulf of California (which is not the same as the well-known Santa Catalina Island off of the US state of California). Nightsnakes are found all around the shoreline of the Gulf of California, and they are obviously exceptional over-water dispersers, because they occur on many of the islands in that region as well. 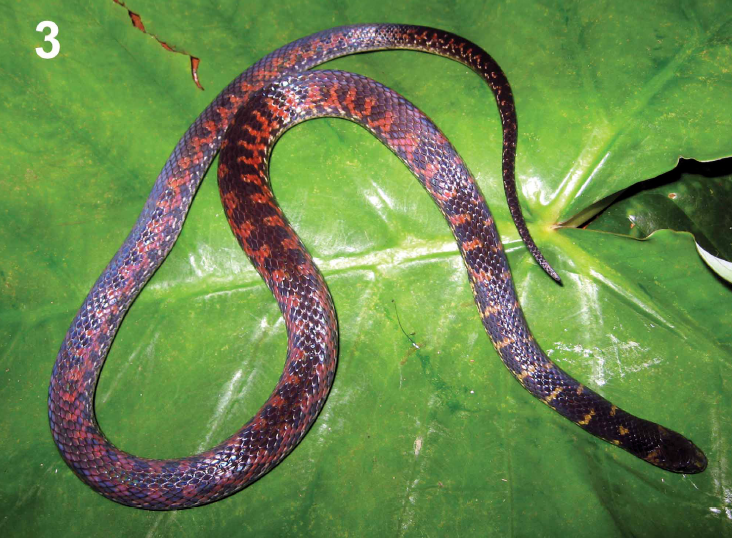 Angel’s Stream Snake (Paratapinophis praemaxillaris) was described from two newborn specimens from northern Laos in 1929. At that time it was placed into a new genus because of an unusual process on its nose, but a few years later it was moved into the cosmopolitan genus Opisthotropis. Two more specimens were collected in the 1980s, but it wasn't until 2008, when five adult specimens were collected from a pool at the base of a waterfall on the Nan River in northern Thailand, that it became clear that the nose structure was actually an egg tooth, a structure normally lost a few days after hatching. 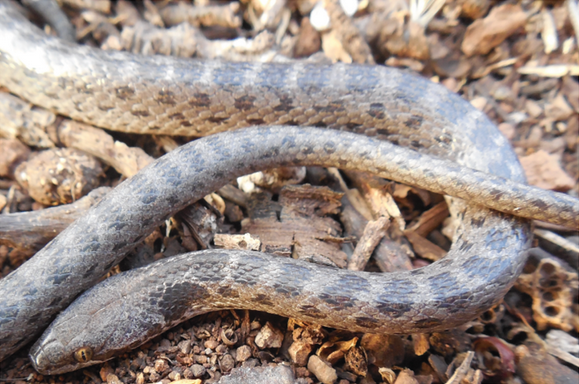 At that time, Paratapinophis was placed back into its own genus because of several other formerly-overlooked unique features, including sexually dimorphic color, pattern, and scale ornamentation. Like most other natricines, this species eats fishes. Chersodromus rubriventris, the Redbelly Earth Runner, was discovered in a cloud forest in San Luis Potosí, Mexico, just after the end of World War II and described a few years later by American herpetologist and spy Edward H. Taylor, who also used his biology as a cover for work in the Philippines, Russia, and Sri Lanka during both world wars. Two other specimens, one from the late 1960s and the other from the early 1980s, were known, but in 2013, a team of herpetologists from the Universidad Autónoma del Estado de Hidalgo found three individuals in a cloud forest in nearby Hidalgo, doubling the number of specimens and photographing the snake alive for the first time. Stomach contents included beetle larvae and ants, both of which are unusual prey for a dipsadid snake. The genus Atractus, a group of burrowing snakes found from Panama to Argentina, is the most diverse alethinophidian snake genus, with over 130 species, most of which are only known from a few specimens. Recently Paulo Passos of the Brazilian National Museum matched up several previously mis- or unidentified Atractus specimens in South American museums with their species, constituting rediscoveries of sorts. For example, Wagler's Ground Snake (Atractus wagleri) was described in 1945 from a single specimen from western Colombia, and that specimen was lost in a fire in 1948. 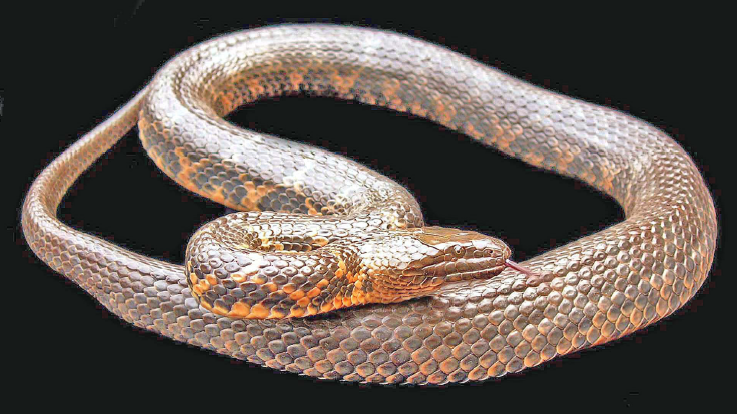 In 2009 Passos located three additional specimens of this poorly known snake in museums in Colombia. Another species, the Modest Ground Snake (Atractus modestus), was described in 1894 by the great Belgian zoologist George Boulenger, from a single specimen from western Ecuador. In 2007 Passos located more specimens in Ecuadorian museums, expanding the range of the species across most of the country. Although species of Atractus are seemingly quite rare, occurring at high elevations and having secretive fossorial habitats, a large number of Atractus specimens remain misidentified or unidentified in herpetological collections, so our knowledge of these snakes stands to improve dramatically as these are examined and described. The Lichen-coloured or Argus Snail Sucker (Sibon argus) is an extremely slender arboreal dipsadine snake with eye-like ("ocellate") spots. It was originally described from a single specimen from southeastern Costa Rica in 1876, by renowned paleontologist Edward Drinker Cope (who feuded with O.C. Marsh in the "Bone Wars" over who could discover more dinosaurs, the subject of an upcoming film starring Steve Carrell as Cope). The validity of the species was uncertain because of the subsequent description of other gracile snakes with ocellated patterns from the same region. In his classic revision of Neotropical snail- and slug-eating snakes, James Peters suggested that Cope's specimen might be aberrant, or perhaps that it represented one half of a species with strong sexual dimorphism (which is rare in snakes), because the only known S. argus specimen was a male, and another species, Sibon longifrenis, was known at the time from just two specimens, both females. Males and females of the same species had been described as separate species before. Ultimately, Peters decided that the two species were probably different, and he was proven right in 1992, when tropical herpetologist Jay Savage was preparing his opus on Costa Rican herpetofauna. Savage discovered both male and female specimens that best matched Cope's 1876 S. argus in the collections of the University of Kansas and the Universidad de Costa Rica. 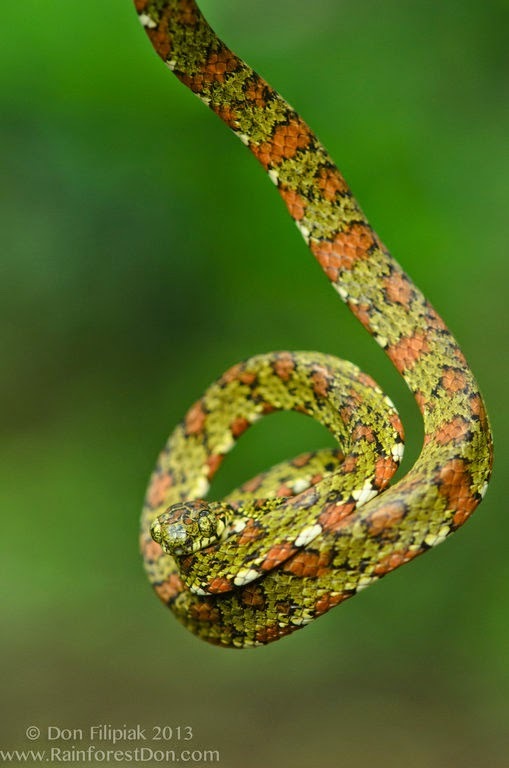 The snakes had been collected in evergreen forests in Panama and Costa Rica, near the type locality of S. argus. With Roy McDiarmid, Savage redescribed the species, which has become much more well-known since. A recent study by Julie Ray and colleagues documented a more diverse diet for this species than previously expected, including other gooey prey such as oligochaete worms and frog eggs. Unfortunately for Sibon argus, both of these prey types are in decline in the neotropics, the worms due to overcollection of their bromeliad homes for horticulture, and the amphibians due to the devastating effects of the amphibian chytrid fungus Batrachochytrium dendrobatidis. Other examples of rediscovered snakes abound. The Uluguru Worm Snake (Letheobia uluguruensis) was described from four specimens collected in 1926 from the Uluguru Mountains of eastern Tanzania, a mountain range with dozens of endemic species, and was not seen again until 2004, when four were dug up by local people employed by a group of herpetologists from the London Natural History Museum and the University of Glasgow to search for caecilians. 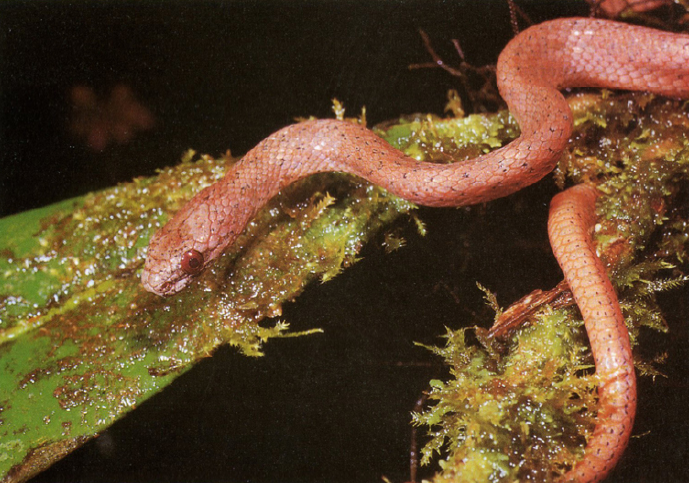 Another blindsnake, Typhlops tasymicris, was rediscovered on Union Island, St. Vincent and the Grenadines, in 2010. An entire genus of blindsnake, Xenotyphlops, was rediscovered in Madagascar, in 2007, 102 years after it's description. A rare sea snake, Hydrophis parviceps, was originally collected by the Danish research vessel Dana and described in 1935 and was seen again only once in 1960 until three turned up in fisheries bycatch off of Vietnam in 2001. Another species of rare sea snake, H. bituberculatus, was rediscovered off Sri Lanka in the late 1980s, over 100 years after the first one was collected (although the fishermen who collected the specimen were so secretive that they refused to divulge the location). One of the rarest snakes in Madagascar, a slow-moving reddish-orange species called Brygophis coulangesi, was first collected in 1968, when one fell from a tree and vomited up a chameleon, with a second specimen found on a cloudy, rainy night during a rain forest survey in 1998, over 300 miles to the north of the first. A second specimen of another Malagasy lamprophiid, Alluaudina mocquardi, was discovered in a pitch-black cave in northern Madagascar in 1982, 50 years after the first was found in a different cave nearby. 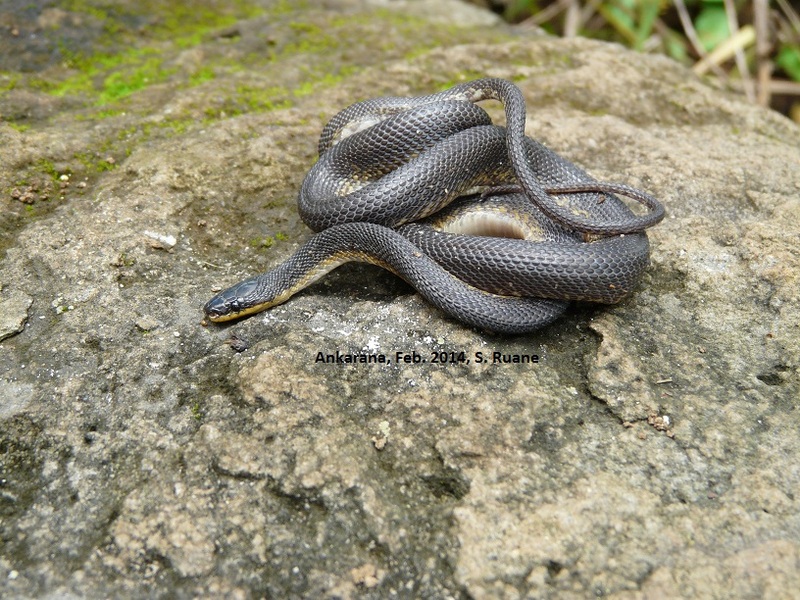 I don't think any more have been found since, so this one should be getting ready to be rediscovered again soon (edit: City University of New York snake biologist Frank Burbrink informed me that on his recent trip to Madagascar they turned up an Alluaudina mocquardi in tsingy rock at Ankarana - see photo here)! 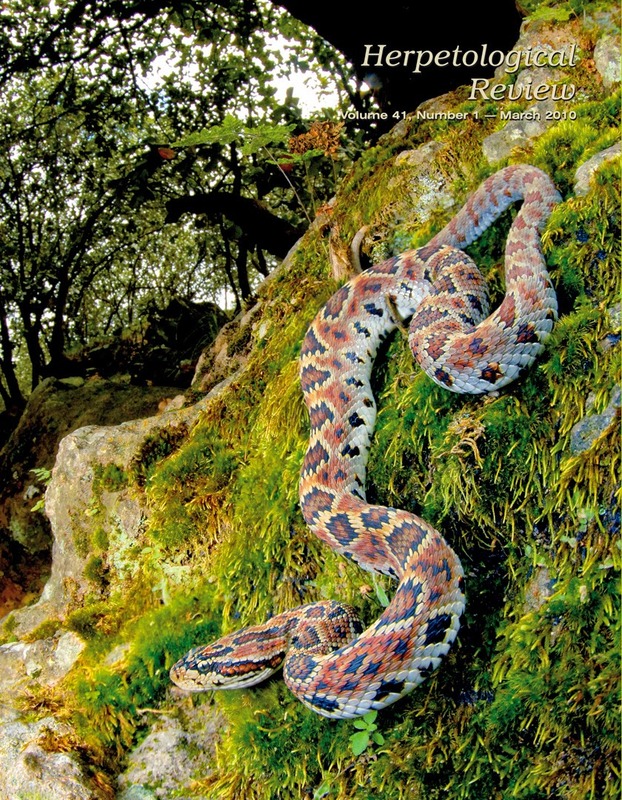 A high-profile rediscovery graced the cover of the March 2010 issue of the journal Herpetological Review, which featured a photograph of a long-sought-after species of rattlesnake, the Autlán Long-tailed Rattlesnake (Crotalus lannomi). Discovered in the summer of 1966 by Joseph Lannom, C. lannomi became sort of a “holy grail” of rattlesnakes in the decades that followed, as numerous herpetologists ventured into the mountains of western Jalisco in search of it. They were stymied by heavy fog and dangerous flooding, roads with treacherous curves and highway robberies, and drug-related violence. In 2008, five specimens of C. lannomi were found in the foothills of Colima, roughly 50 km from the type locality in Jalisco, in some of Mexico's most pristine forest habitat. Although most of this was new to me, I've actually written about a different rediscovered viper before, the Spider-tailed Adder (Pseoducerastes urarachnoides) of Iran, which was discovered in 1968 and was at first thought to have either a tumor, a congenital defect, or a growth caused by a parasite, or maybe a spider clinging to its tail (turns out its tail is modified into a lure to attract spider-eating birds). 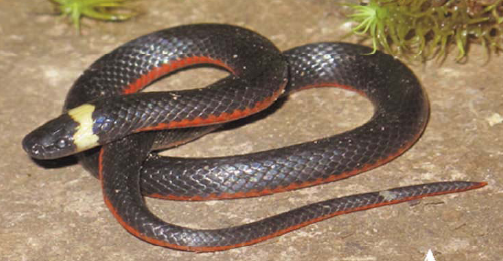 Also, in one of my first articles, I wrote about the South Florida Rainbow Snake (Farancia erytrogramma seminola), described by Wilfred T. Neill in 1964 from Fisheating Creek in Glades County near Lake Okeechobee, Florida, and presumed extinct, never seen again since. To the best of my knowledge this subspecies has yet to be rediscovered, despite a $500 reward from the Center for Snake Conservation and Center for Biological Diversity. (Edit: a diligent reader reminded me that I also wrote about another snake that hasn't been seen since 1975 in one of my earliest articles, the Round Island Burrowing Boa, Bolyeria multocarinata). Undoubtedly there are numerous snake species left to be discovered and rediscovered, and in many cases almost nobody's out there looking. The Reptile Database has predicted that the total number of described reptile species will surpass 10,000 in 2014, and that non-avian reptiles will perhaps eclipse birds in diversity soon after that. 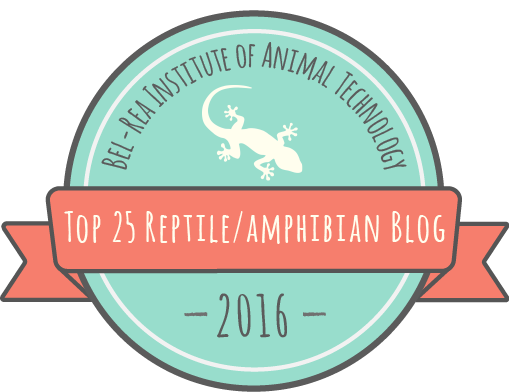 With snakes currently at 3,466, representing just over one third of reptiles, maybe you will be the next to rediscover a snake thought lost! Thanks to Dan Mulcahy and Don Filipiak for the use of their photographs. I remember reading about the Autlan Long-tailed Rattlesnake, and that only the holotype specimen was known to exist. I presumed that extensive habitat degradation in Mexico had caused its demise. Good to know that it, and the other rediscovered species still survive. Glad I could brighten your day John (or more accurately, that Crotalus lannomi could) - I'm certain that the day was bright indeed for the folks who rediscovered that one.